New Delhi: Union Agriculture & Farmers Welfare Minister Shri Radha Mohan Singh has said that in the last four and half years, the Ministry of Agriculture and Farmers’ Welfare has taken several steps and started various schemes to transform Indian agriculture like neem-coated urea, Pradhan Mantri Fasal Bima Yojana, Har Khet Ko Pani, e-NAM, strengthening of Gramin Haat, Rashtriya Gokul Mission, MSP, income support of Rs 6000 to farmers, KCC for Animal husbandry and Fisheries, Rashtriya Kamdhenu Ayog, separate department for Fisheries etc. The budgetary allocation for the Agriculture and Farmers’ Welfare Ministry has been raised by around 2.5 times from Rs 58,080 crore in 2018-19 to Rs 1,41,174.37 crore in 2019-20. In fact, the budgetary allocation of Rs 1,41,174.37 crore in 2019-20 is 16.6% more than Rs 1,21,082 crore during UPA (2009-14). 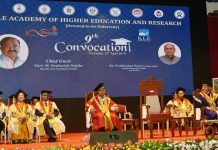 Speaking on the occasion of 57th convocation ceremony of Indian Agriculture Research Institute (IARI) today, he said that by 2050 the population of the country would increase to 166 crore and there is immense potential for food security in eastern and north-eastern states. To fulfill this objective, IARI-Jharkhand’s administrative and academic building was inaugurated on Jan 27, 2019 after the Prime Minister laid the foundation stone on June 28, 2015. The IARI-Assam will also be operational soon. 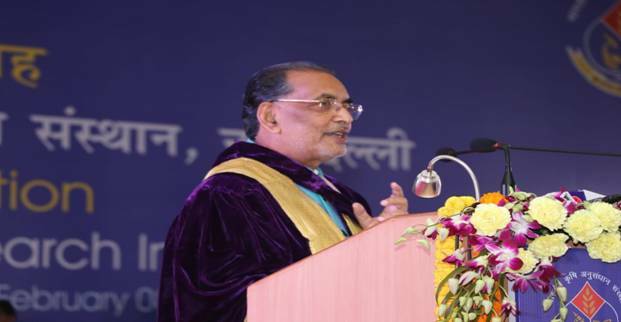 Shri Singh added that the advanced crop varieties and techniques developed by the Institute have played an important role in strengthening the economy and enhancing the lives of farmers. ‘Pusa Basmati 1121’ developed by the Institute has earned foreign exchange worth more than Rs 1.7 lakh crore in the last ten years. Recently, ‘Pusa Basmati 1718’, a better variety of Pusa Basmati 1121, has been developed which is resistant to bacterial leaf scorch. Similarly, IARI Wheat varieties (HD 2967 and HD 3086), which are spread over 10 million hectares of the country’s covered wheat area, is accelerating growth in wheat production. There has also been a remarkable progress in developing high yielding, disease-resistant and nutritious varieties of maize, arhar, vegetable, flowers and other crops. He praised IARI, New Delhi for developing neem-coated urea. Government of India has made use of neem-coated urea mandatory. It increases the efficiency of 10% nitrogen usage compared to uncoated urea thereby saving 10% urea. The Minister informed that IARI-Post Office Linkage Extension Model has proved important in expansion program of IARI technologies. Under the “Mera Gaon – Mera Gaurav” initiative, the institute has adopted more than 600 villages in and around Delhi-NCR, where scientists regularly share technology with farmers.